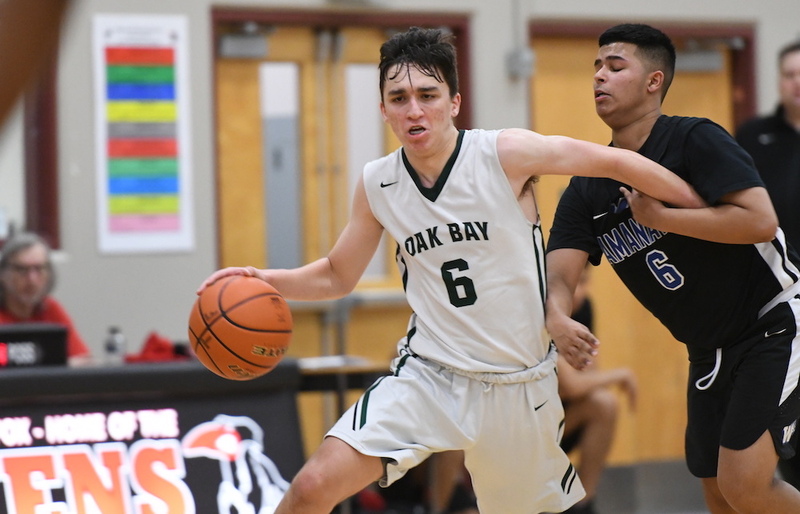 On Saturday, at the Western Canada Invitational tournament in Kelowna, the senior guard with Victoria’s Oak Bay Bays set what is believed to be the all-time provincial boys senior varsity single-game scoring record when he poured home 94 points in 114-88 win over Edmonton’s Ross Sheppard Thunderbirds. The final score sheet is accompanied by a hand-written ‘96 pts’ but the final total is actually 94 (see below). Either way, the voluminous total tops the 82 points that Greg DeVries scored when he set the unofficial record some 27 years ago. DeVries of Nelson’s L.V. Rogers Bombers, scored those 82 points in a win over the Grand Forks Wolves in a game played some 27 years ago in 1992. DeVries later embarked on a university career with the Alberta Golden Bears. From that point on, as word spread through the crowd, the fourth quarter became something of an event. No one was sure at any precise time how many points Maffia had, but his teammates kept feeding him the ball, and he just kept scoring. Maffia came off the floor over the final two minutes and could likely have scored 100. “I was getting a standing ovation from the fans,” Maffia chuckled. No one is more familiar with Maffia’s game than his head coach with the Bays, but afterwards even Chris Franklin was having trouble finding the precise words. 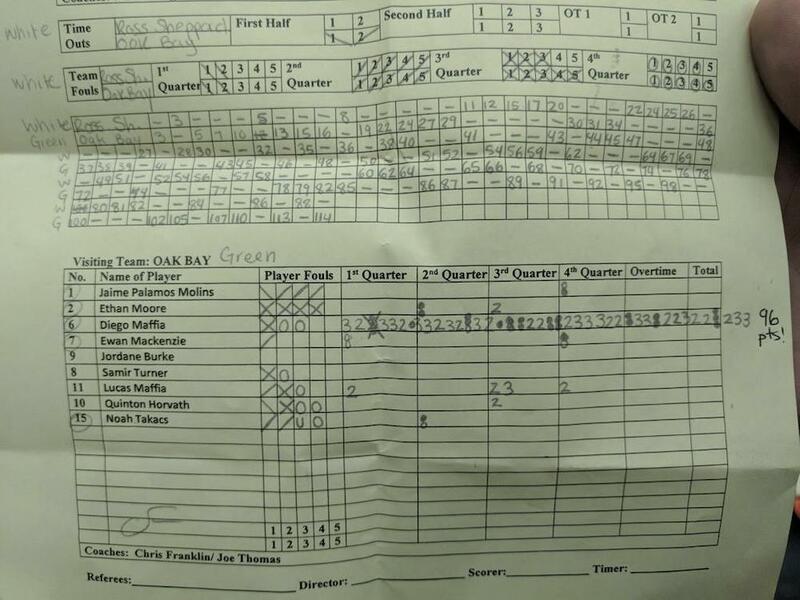 Maffia’s career-high came earlier this season when he scored 67 points against Langley’s Walnut Grove Gators. Last season, as a Grade 11 on a team with much more overall balance and depth, Maffia still thrived as pure scorer. This season, however, he has been as primary a scorer as we have seen on any top-tiered Top 10 team for perhaps two straight decades. You know he has to score for the Bays to win, the fans know it, his teammates know it, and so does the opposition. And he just keeps on finding ways to score. Yet Maffia isn’t just a shooter, and that’s a key distinction as you dissect his line from Saturday’s game. Yes, he hit 15 three-point buckets, but he also hit 15 regulation field goals and he was 19-of-20 from stripe including his last 16 straight. For the basketball purist, like Langara Falcons’ head men’s coach Paul Eberhardt, it’s facts like those that make Maffia such a blue-chip player, but also a curious outlier. “He’s not a big guy, and he is such a pure shooter,” Eberhardt begins, offering just a part of the picture, the kind which might cause others to pigeon-hole Maffia as a one-dimensional player. He’s got the steel will of a Steve Nash, he’s got a dramatic flair to score like a Gareth Davies, and as Eberhardt correctly points out, an ability to find ways to make buckets like DeVries had. 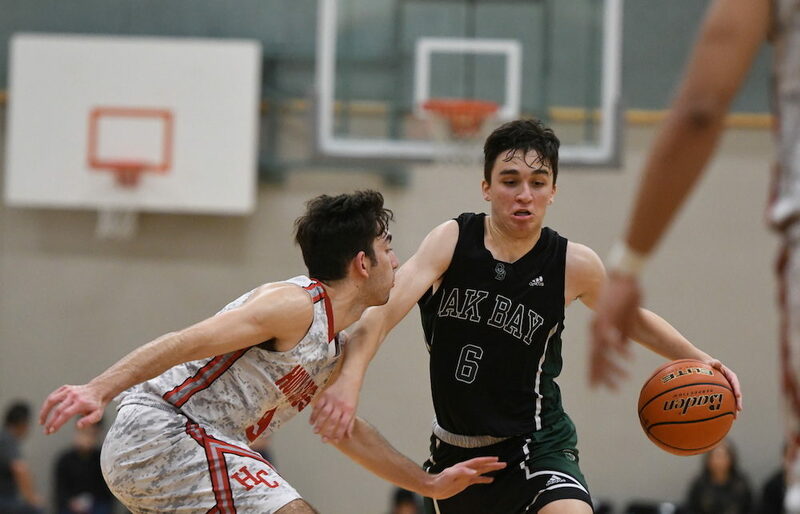 But most of all, playing his senior varsity career against elite, blue-chip Quad-A competition game in and game out, he’s as unstoppable a scoring force as our provincial high school game has ever seen.